This chapter was updated in January 2018 to update claimant count, child poverty and economy data. This chapter includes information on surrey’s economy and looks at the measures of deprivation. It also includes information about access to services and car availability. Surrey is generally regarded as a wealthy county with a strong economy and low levels of deprivation. But service providers should be aware of the pockets of deprivation that do exist, and the impacts of poverty and deprivation on health and wellbeing and life outcomes. The chapter also looks at employment status of Surrey residents and how this may impact on health and wellbeing. On a scale of average Index of Multiple Deprivation, where 1 is most deprived, at County level Surrey ranks 150 out of 152. In most of the individual domains, Surrey has fewer than 20 LSOAs in the most deprived 2 deciles. The exceptions are Education, Skills and Training and Barriers to Housing and Services. Unemployment in Surrey is much lower than the national average. In October 2017, 4,910 people (0.7% of the population aged 16-64) were claiming Jobseeker’s Allowance or receiving Universal Credit as a jobseeker. Of these, 2,148 have been claiming for more than 6 months. In England the rate was 1.9%. The claimant rate in Surrey has fallen since a peak of 15,200 (2.1%) in February 2010. In May 2016, 4.4% of the working age population were claiming out of work benefits. The Income Deprivation Affecting Children Index (IDACI) indicates that 10% of Surrey’s children are affected by income deprivation. However in the worst affected areas, parts of Westborough ward (Guildford) and Walton North ward (Elmbridge), over 40% are affected. The Income Deprivation Affecting Older People Index (IDAOPI) indicates that 8% of Surrey’s older people are affected by income deprivation. However in the worst affected areas, parts of Goldsworth East and Maybury & Sheerwater wards (both in Woking), over 40% are affected. Low income households are at a greater risk of fuel poverty, contributing to social and health inequalities. A family’s income makes a significant difference to children’s cognitive, behavioural and health outcomes. Children living in poverty are almost twice as likely to live in bad housing. This has significant effects on both their physical and mental health, as well as educational achievement. In 2016, Surrey’s economy, measured by the Gross Value Added (GVA), was worth £40.1 billion. This amounted to 16% of the economy of the South east, while in terms of population Surrey makes up just 13% of the South East. The Annual Survey of Hours and Earnings showed that in 2016 Surrey residents working full time earned on average 22% more than in the country as a whole. Males in Surrey working full time earned 21% more than females working full time. Surrey residents are more likely to be self-employed than in the country as a whole, with 12.5% self-employed compared with 9.8% nationally. Surrey residents are half as likely to be economically inactive due to long term sickness with 2% compared with the national figure of 4%. Surrey has a higher proportion of its population in higher status occupations than the country as a whole. Self-reported stress, depression or anxiety is significantly higher among higher managerial and lower managerial professionals. At the census Surrey residents in employment were more likely to be working more than 49 hours a week than the national average of 13.3%. They were also more likely to travel more than 30km to work. Working long hours is associated with increased risks of heart disease, non-skin cancer, arthritis, and diabetes. According to the 2011 Census, 9% of Surrey residents do not have access to a car or van in the household. This rises to 19% of people aged 65+ and almost half (49%) of people aged 85+. In rural areas, 8% of households do not have access to a car. Almost all Surrey households are within a 15 minute journey by car of a food store, primary school, GP surgery, and employment centre with at least 500 jobs. Almost all are within a 30 minute car journey of a town centre, secondary school and hospital. However when using public transport or walking, 34% cannot reach a GP surgery within 15 minutes and only 30% of households are within a 30 minute journey to a hospital. In addition to the Index of Multiple Deprivation (IMD) and the seven domain indices, there are two supplementary indices: the Income Deprivation Affecting Children Index (IDACI) and the Income Deprivation Affecting Older People Index (IDAOPI). A range of summary measures are available for higher-level geographies including local authority districts and upper-tier local authorities, local enterprise partnerships, and clinical commissioning groups. On a scale of average IMD overall index, where 1 is most deprived, Surrey ranks 150 out of 152 county councils, London boroughs, unitary authorities and metropolitan districts. At Local Authority level the most deprived borough is Spelthorne which ranks 236 out of 326 with Waverley the least deprived, ranking 323. At CCG level, Surrey’s CCGs rank from 189 (East Surrey) to 207 (Surrey Downs) out of 209. However IMD is best used as an indicator of relative deprivation at a small area level. The 32,844 Lower Super Output Areas (LSOAs) in England are ranked into deciles so that the most deprived 3,284 (10%) areas are in decile 1, the next 3,284 are in decile 2 etc. In the overall index there are no Surrey LSOAs in decile 1, and just 3 in decile 2. These are parts of Westborough ward (in Guildford), Merstham ward (Reigate & Banstead) and Maybury & Sheerwater ward (Woking). More than 70% of Surrey’s LSOAs are in the least deprived deciles 8, 9 and 10. The Education, Skills and Training Deprivation Domain measures the lack of attainment and skills in the local population. The indicators fall into two sub-domains: one relating to children and young people and one relating to adult skills. 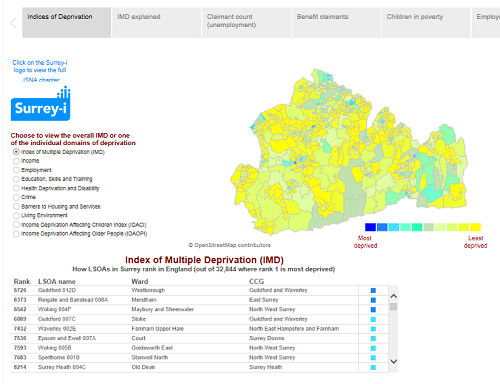 There are 13 Surrey LSOAs in the most deprived decile and a further 28 in decile 2. The Barriers to Housing and Services Domain measures the physical and financial accessibility of housing and local services. The indicators fall into two sub-domains: ‘geographical barriers’, which relate to the physical proximity of local services, and ‘wider barriers’ which includes issues relating to access to housing such as affordability. There are 36 Surrey LSOAs in decile 1 with a further 62 in decile 2. Unemployment in Surrey is much lower than the national average. In the period July 2016-June 2017 the official measure of unemployment in Surrey was 3.0% of the economically active population compared with 4.7% in England. In October 2017, 4,910 people (0.7% of the population aged 16-64) were claiming Jobseeker’s Allowance or receiving Universal Credit as a jobseeker. Of these, 2,148 had been claiming for more than 6 months. In England the rate was 1.9%. The claimant rate in Surrey has fallen since a peak of 15,200 (2.1%) in February 2010. In May 2016, 31,630 people, 4.4% of the working age population, were claiming out of work benefits. As well as people on Jobseeker’s Allowance, this included 23,320 receiving Employment and Support Allowance (ESA) and 4,230 lone parents. The IDACI indicates that 10% of Surrey’s children are affected by income deprivation. However in the worst affected areas, parts of Westborough ward (Guildford), and Walton North ward (Elmbridge), over 40% are affected. In May 2016, 14,920 children were living in households where at least one parent or guardian claimed one or more of the following out-of-work benefits: Jobseeker’s Allowance, Income Support, Employment and Support Allowance, Incapacity Benefit or Severe Disablement Allowance, Pension Credit. In August 2014, a total of 20,700 children under 16 were living in low income households. This is defined as “children in families in receipt of either out of work (means-tested) benefits, or in receipt of tax credits where their reported income is less than 60 per cent of median income”. The IDAOPI indicates that 8% of Surrey’s older people are affected by income deprivation. However in the worst affected areas, parts of Goldsworth East and Maybury & Sheerwater wards (both in Woking), over 40% are affected. In May 2016, 17,700 people of pension age were receiving income related benefits in addition to their state pension. Surrey is generally regarded as a wealthy county with a strong economy. In 2016, Surrey’s economy, measured by the Gross Value Added (GVA), was worth £40.1 billion. This amounted to 16% of the economy of the South east, while in terms of population Surrey makes up just 13% of the South East. Surrey’s GVA per person at £34,070 is greater than the rest of the major population centres apart from London. GVA is a measure of the value of goods and services produced in a geographical area or sector of the economy. On another measure, Surrey’s Gross Disposable Household Income per head was 39% greater than the country as a whole in 2015, and second only to Inner London West, which includes the City of London, Westminster and Kensington and Chelsea. The Annual Survey of Hours and Earnings showed that in 2017 Surrey residents working full time earned on average £680 per week, 22% more than in the country as a whole. Males in Surrey working full time earned 21% more than females working full time, £733 per week compared with £604. waiting to start a job already obtained and available. At the 2011 Census, almost three quarters (73.6%) of Surrey’s population aged 16-74 was economically active. 79.7% of males and 67.7% of females were economically active. This is slightly higher than the national average of 69.9%. (75.2% of males and 64.7% of females). Surrey residents are more likely to be self employed than in the country as a whole, with 12.5% self employed compared with 9.8% nationally. The 2011 Census also recorded that 6% of the economically active population have a long term illness or disability which affects their daily activities or work they can do. According to Department of Transport journey time statistics, almost all Surrey households are within a 15 minute journey by car of a food store, primary school, GP surgery, and employment centre with at least 500 jobs. However if using public transport or walking, 34% cannot reach a GP surgery within 15 minutes, 32% cannot reach an employment centre, 20% of pupils cannot reach a primary school and 15% of households cannot reach a food store. Almost all Surrey households are within a 30 minute car journey of a town centre, secondary school and hospital. If using public transport or walking, 89% of pupils can reach a secondary school and 94% of households can reach a town centre within 30 minutes. However only 30% of households are within a 30 minutes of a hospital if using public transport or walking. Material mechanisms – Money buys people the necessities for good health such as shelter, warmth and food. Consequently, detrimental health effects can arise from sudden income losses that result from unemployment or family breakdown. Psychosocial pathways – Stress related illness can arise from the lack of support some people in disadvantaged circumstances may have to help cope with difficult situations. This can be compounded by distressed feelings around having a lower status in society due to a low income. Behavioural pathways – Many negative health behaviours are more prevalent among socially disadvantaged groups partly because some healthy behaviours can be expensive such as a healthy diet, joining a gym or taking part in extracurricular sporting clubs. People may use some unhealthy behaviours such as smoking or drinking alcohol to cope with difficult situations. Poor health leads to low income – Ill health can prevent people from entering paid employment, which reduces their income and therefore also exacerbates the risk of unemployment related health issues. More long term ill health in childhood may influence educational outcomes which can affect employment and income opportunities later in life. These theories are not mutually exclusive but reveal the interconnectedness of various causal factors. Low income households are at a greater risk of fuel poverty, contributing to social and health inequalities. Cold homes can affect or exacerbate respiratory, circulatory and mental health problems. Cold homes can also affect wider determinants of health, such as educational performance among children and absence from work. Vulnerable groups such as young children, older people and those with pre-existing health problems are particularly susceptible to cold related illnesses. Among older people, cold temperatures can increase the likelihood of strokes, circulatory problems, respiratory problems, hospital admissions, and lower strength and dexterity leading to falls and accidental injuries. A family’s income makes a significant difference to children’s cognitive, behavioural and health outcomes. Children living in poverty are almost twice as likely to live in bad housing. This has significant effects on both their physical and mental health, as well as educational achievement. Children from low income families often forgo events that most of us would take for granted. They miss school trips; can’t invite friends round for tea; and can’t afford a one-week holiday away from home. Longitudinal studies show that children growing up in disadvantaged circumstances have a higher risk of death in adulthood across a vast number of conditions including mortality from stomach cancer, lung cancer, stroke, coronary heart disease, respiratory-related deaths, accidents and alcohol-related causes of death. Surrey has a higher proportion of its population in higher status occupations than the country as a whole. 14.6% are “managers, directors and senior officials” and 21.7% are in “professional occupations” compared with 10.9% and 17.5% respectively in England. Just 7.2% are in “elementary occupations” compared with 11.1% in the country as a whole. Self-reported stress, depression or anxiety is significantly higher among higher managerial and lower managerial professionals. Lower managerial and professional occupations have higher prevalence rates of work-related illness than average, but routine and manual workers have higher rates of workplace injury. Low paid work is often associated with poorer working conditions, including greater risk of injury related to manual labour or repetitive strain, and increased intake of toxins and fumes. The risk of unemployment, unstable employment and repeat unemployment are higher for lower social class groups therefore are more likely to experience poor health arising from these circumstances. Those working in routine and manual jobs are more likely than managerial and professional workers to smoke, with women in this group the least successful at quitting during pregnancy. This group may find it to difficult to quit because smoking is often entrenched in the standard work routines of manual employment. Due to the significant health risks of smoking, these differences in smoking prevalence translate into health inequalities around illness and mortality. At the census 16.7% of Surrey residents in employment were working more than 49 hours a week, compared to the national average of 13.3%. 10% travel more than 30km to work compared with 8% in England. Working long hours is associated with increased risks of heart disease, non-skin cancer, arthritis, and diabetes, with these risks higher for women than men (8). Employees who work long hours have a higher risk of stroke than those working standard hours who display a weaker association with coronary heart disease. These findings suggest the need for greater attention to vascular risk factors in people working long hours (9).